You probably already have some idea. Personality-type testing is common in school and the workplace. Understanding personality types helps us identify strengths, pinpoint weaknesses, and cooperate better with others. The two personality types are polar opposites of one another, yet for the longest time, you were just one or the other, to some degree. There’s a far more common personality type, though–one that falls in the middle of the introverted-extroverted spectrum. See, in order to be either an introvert or an extrovert, you have to be heavier in one type of trait than the other. More outspoken, socially adept people who venture forth with confidence are easy to peg as extroverts. Those who isolate themselves, are more formal, talk less, and prefer to stay out of the limelight clearly leaned toward introversion. This middle group consists of the ambiverts. Ambiverts are not only more common that you might think but also more successful and influential. In his 2013 research paper Rethinking the Extraverted Sales Ideal: The Ambivert Advantage, The Wharton School’s Adam M. Grant examined the correlation between extroversion and sales aptitude. It’s long been assumed that being extroverted makes one a better salesperson. Grant found that the relationship between extroversion and sales performance is actually quite weak. So who does it better? The ambiverts. What is it that makes ambiverts more successful in sales, with traits that surely translate into success and influence in other areas as well? They’re more emotionally stable. Extroverts are not easily influenced by outside factors, while introverts are hypersensitive. 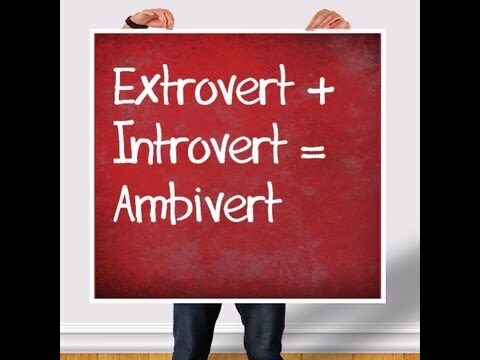 Ambiverts offer a good balance between the two and are referred to as the stability “normal” by famed psychologist Hans Eysenck, who coined the term “ambivert” in 1947. They’re more influential. In Grant’s sales experiment, ambiverts earned average hourly revenues of $155–24% higher than extroverts. People at either extreme end of the introvert-extrovert scale had the worst sales, while those smack in the middle had the highest, at $208 per hour. There you go. The next time someone asks you your personality type, you won’t have to stumble through some explanation of how you’re extroverted in some situations but have introverted moments–and don’t identify completely with one or the other. Just tell them you’re an ambivert. Chances are that’s exactly what you are–an ambivert, as most of us are. Larry Kim is the founder and CTO of WordStream, provider of the 20-Minute PPC Work Week and the free AdWords Grader. Anambra State Gubernatorial Seat: Which Way, Mr. Willie Obiano?